To mark the occasion, Universal Studios Hollywood hosted a festive neighborhood block party attended by special guests Al Jean, Executive Producer of The Simpsons, Nancy Cartwright, the voice of “Bart,” Yeardley Smith, the voice of “Lisa” and Joe Mantegna, the voice of “Fat Tony,” alongside Springfielders – Homer, Marge, Bart and Lisa Simpson, Krusty the Clown and Sideshow Bob. The new themed environment captures the spirit of Springfield, immersing visitors and fans in the world of “The Simpsons” like never before. “Springfield” at Universal Studios Hollywood features the many iconic landmarks made famous throughout the series’ mind boggling 26 seasons, including Springfield Elementary School, Android’s Dungeon Comic Book Store, the cooling towers of Mr. Burns’ Nuclear Power Plant, Springfield Police Station, Aztec Theater and, of course, Kwik-E-Mart. The all-new “Springfield” culinary excursion allows visitors to enjoy the places that helped it earn the distinction of being named “The Fattest Town” by the Duff Book of World Records. Guests may enjoy a “Genuine Clown-Endorsed Meal” at Krusty Burger, grab a slice that’s “a-nice” at Luigi’s Pizza, enjoy a “Taco Fresho” at Bumblebee Man’s Taco Truck, or a platter of Chicken Thumbs at Cletus’ Chicken Shack. To satisfy one’s sweet tooth, guests can visit Phineas Q. Butterfat’s Ice Cream Parlor or go nuts for a Homer-sized helping of drool-worthy donuts at Lard Lad. 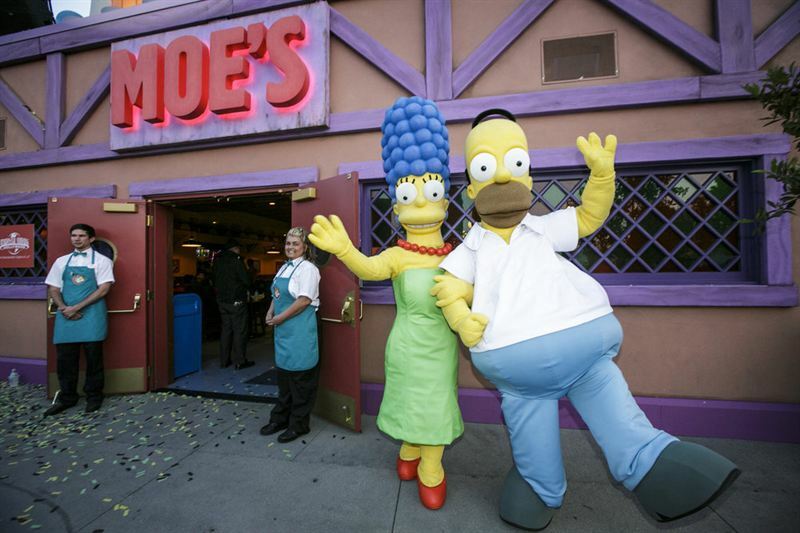 The “Springfield” experience also features Moe’s Tavern, a Duff Brewery and a Duff Beer Garden, where guests can savor an authentic Duff Beer. "I might actually had been excited about the new Simpsons attractions even if we hadn't put our blood into making it great with our fragile egos waiting for the outcome,” said James L. Brooks, Executive Producer, The Simpsons. "The ‘Springfield’ launch at Universal Orlando exceeded all of our expectations with Simpsons fans young and old traveling from around the globe to experience the immersive land. 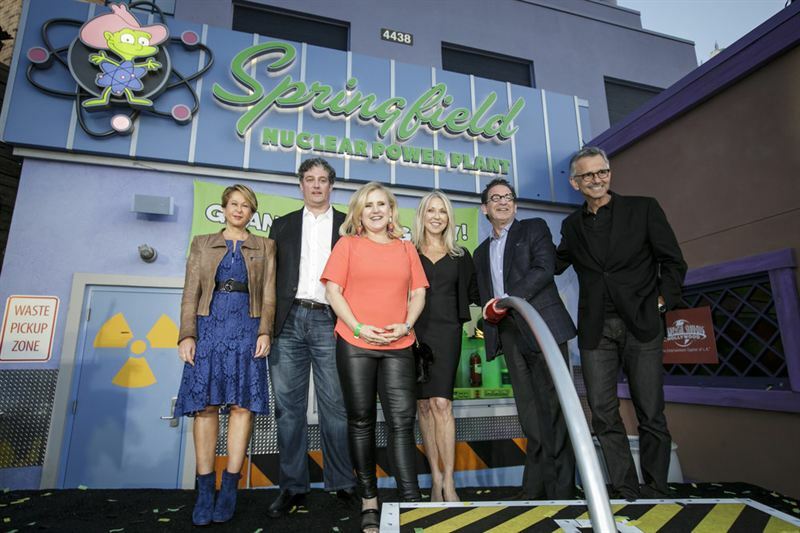 We’re so excited to now bring the world of ‘Springfield’ to Universal Studios Hollywood,” said Jeffrey Godsick, President, Twentieth Century Fox Consumer Products. Currently airing its record-annihilating 26thseason, THE SIMPSONS has won 31 Emmy Awards, 31 Annie Awards, a 2015 People's Choice Award, was the first animated series to win a Peabody Award, and was nominated for an Academy Award in 2012 for the theatrical short "The Longest Daycare." “The Simpsons Movie” was a hit feature film, their mega-attraction “The Simpsons Ride” at Universal Studios Hollywood has received historic expansion updates with the addition of “Springfield” and the show was honored with a Star on The Hollywood Walk of Fame in 2000. It has been named the “Best Show of the 20th Century” by Time Magazine, and called the "Greatest American Sitcom" by Entertainment Weekly in 2013.